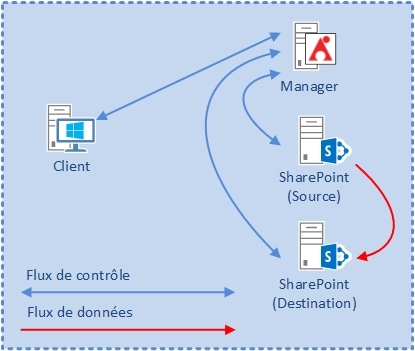 The SharePoint MVP Benoit Jester has recently posted an excellent French-speaking presentation comparing SharePoint content migration tools. This gave me an opportunity to discuss them from an architecture perspective. In large or complex infrastructures/organizations, the architecture of the migration solution can be nearly as important as the tools’ functionalities or results. You got it, in this post I will therefore not cover those two last criteria. 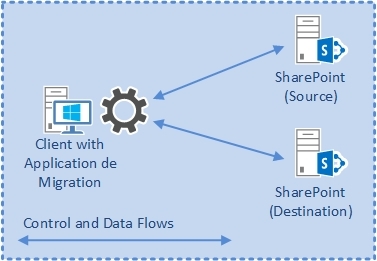 Like depicted on the schema hereunder, fat client architecture implies that the migration logic entirely resides in the client application, the application interacting with SharePoint through the standard remote API’s such as web services similarly to Office applications, SharePoint Designer, OneDrive for Business Client or so. Optionally, a server-based extension can be installed on SharePoint server Under the shape of a web service too, increasing functionalities and ultimately, migration fidelity. No deep infrastructure change required: to the exception of the optional server-side extension (pretty light actually), there is no need for deploying heavy server-side component nor configuration. This allows “tactical” migrations to take place very easily and over a very short time frame. Obvious network flows: in case perimeter firewall must be configured, flow are extremely simple are reduced. They are actually identical to the ones used between a browser and the SharePoint infrastructure, therefore, surely already in-place. 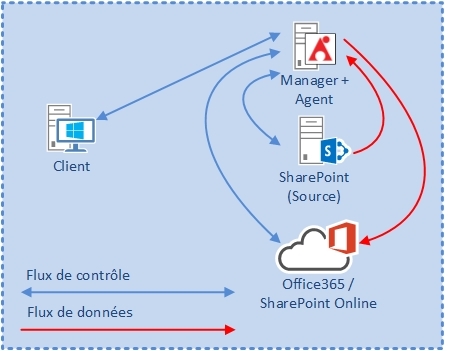 The agents: installed on one or multiple SharePoint server as well as on the server hosting the manager, their purpose is to execute the migration instructions received from the manager through the control flows. Afterwards, source agent communicates with the destination agents to migrate the content. The active element of the agent, implemented under the shape of a Windows service, requires high privileges at windows, SQL and SharePoint levels, close to the ones granted to SharePoint’s farm account. The DocAve solution being entirely built on those components for migration as well as for other purposes, the activation of each additional feature (or module) is just a question of configuring the appropriate licenses using license files provided by the vendor. Let’s take the following scenario: a SharePoint 2007 infrastructure running on Windows Server 2003 to be migrated to Office 365. Considering the fact that data always travel from agent to agent, in this case, there is no destination agent on the Internet. However, the migration solution must cope with with O365 standards (such as authentication using WS-Federation…) and unfortunately, the necessary software pieces to do so are not available to Windows Server 2003 (Framework 4.5, WIF…). The workaround consists in hosting the DocAve Manager and an agent on a dedicated server running at least Windows Server 2008 while another agent is running on the farm. DocAve will automagically established the flow between agent and to the Internet as shown in the schema below. Credits to AvePoint for the technical guidance and to @j3rrr3 for the set-up. Categories: Architecture, Migration, Office 365, SharePoint, Tools | Permalink. The October 2014 Cumulative Update for SharePoint 2013 (including Project Server and Office Web Apps) has just been made available. I recommend to carefully read Stefan Goßner [MSFT]‘s blog for matching KB’s, Download links and necessary clarifications about prerequisites, patching sequence and packages: October 2014 CU for SharePoint 2013 has been released. Categories: Announcements, Servicing, SharePoint 2013, Software Updates | Permalink.